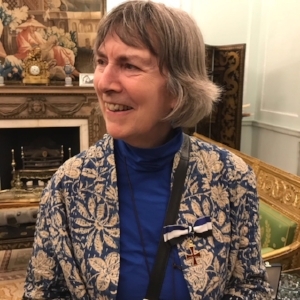 Margaret Jull Costa was last night awarded the Ordem do Infante Dom Henrique for services to Portuguese literature at the Portuguese Embassy in London. She is the award-winning translator of many Spanish and Portuguese authors, notably Javier Marías and Bernardo Atxaga from the Spanish, and Jose Saramago and Fernando Pessoa from the Portuguese. Margaret Jull Costa won the International IMPAC Dublin Literary Award with her translation of A Heart So White by Javier Marías in 1997, and she is the three-times winner of the Oxford Weidenfeld Translation Prize, (for her translations of All the Names, by Jose Saramago, in 2000, The Maias, by José Maria de Eça de Queirós, in 2008, and The Elephant's Journey, by Jose Saramago, in 2011). She became a Fellow of the Royal Society of Literature on 2013 and was made an O.B.E. in 2014. She has translated Crimes and The Sickness by Alberto Barrera Tyszka, both published by MacLehose Press, and Nevada Days by Bernardo Atxaga, which we published in 2017. We are delighted that Margaret has received this richly deserved award, and send her our warmest congratulations.